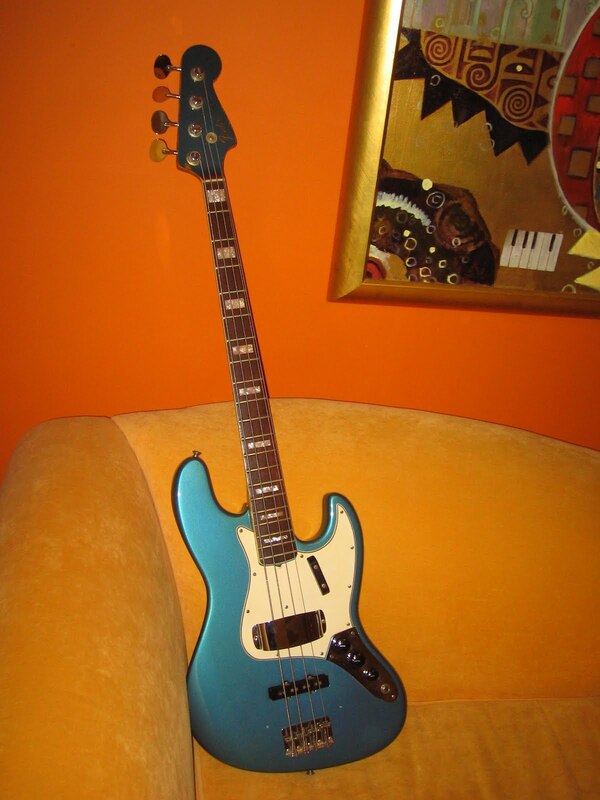 I have owned this bass for over a decade - I bought it from a guy in New Jersey, with the body completely stripped and clear coated but with an original Lake Placid Blue headstock. 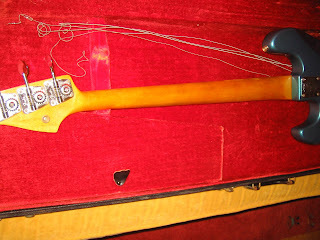 My plan all along was to restore it to its original finish - a couple of false tries and I put the bass away in pieces for nearly 10 years. 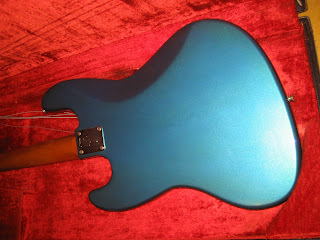 Finally, over the past few months, I pulled the bass out again and made a serious effort to give the body a refinish that would match the aged Lake Placid Blue headstock and restore the bass to its original appearance. I used acrylic lacquer from TCP Global - who specialize in products for restoring vintage automobiles. 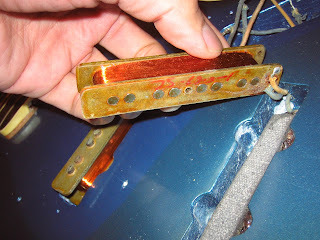 Fender did use acrylic lacquer for custom colors from sometime around early 60s, when car manufacturers switched from older nitrocellulose based colors to acrylic lacquer. 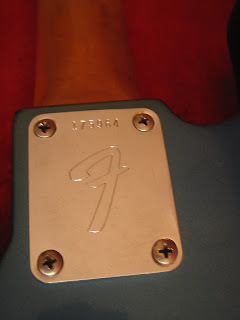 Lake Placid Blue was originally a 1958 Cadillac color, but was no longer being used by GM by 1960 when Fender began using it as an optional custom color. 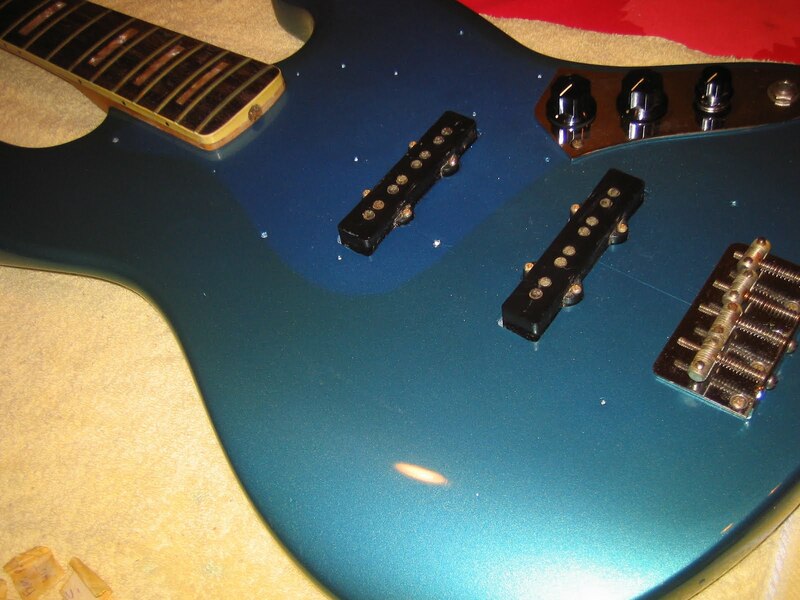 When Fender switched to acrylic colors, new formulas were developed for the older automotive colors. 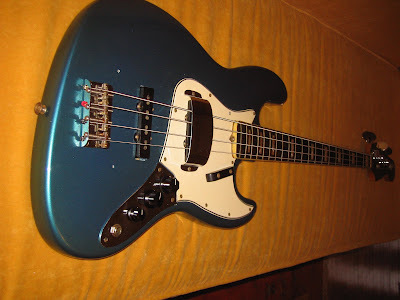 While I feel pretty confident that TCPs colors ARE accurate representations of the original nitrocellulose colors of the 1950s, I am not confident that the colors Fender used during the 60s were always accurate representations of the original 1950s colors. So why is this whole discussion relevant ? Well - when I initially tried refinishing the body of this 1966 Jazz Bass, it became obvious that the headstock was a lighter and more silvery blue color than the new Lake Placid Blue finish on the body - especially once I "aged" the clear coat by yellowing it. I then pulled out my Pelham Blue (Gibson's 1960s metallic blue) lacquer - and began color blending - shooting test pieces of masonite and then applying a yellowed clear coat until I got a mix that looked like the headstock. The final mix was roughly 2 parts Lake Placid Blue to 1 part Pelham Blue. Even though it may be hard to tell on a computer monitor and with different flash angles, these two pictures should show that the color ended up being a nearly perfect match after I carefully tinted the clear coat to get an "aged" effect. 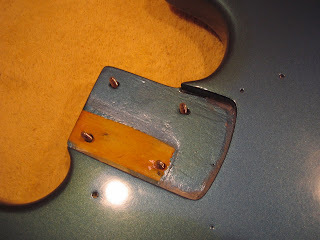 The obvious difference is that lack of finish checking, chips and wear on the refinished body. 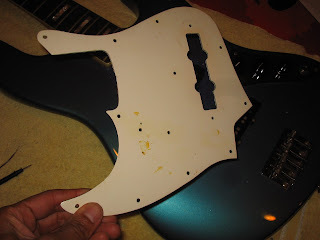 However, I used a very low plasticizer content nitro for the final clear coat, so the body should begin to check subtly within the next few months. If the next owner plays this bass like it should be played, I'm sure in a few years it will be hard to tell it's a refinished body. 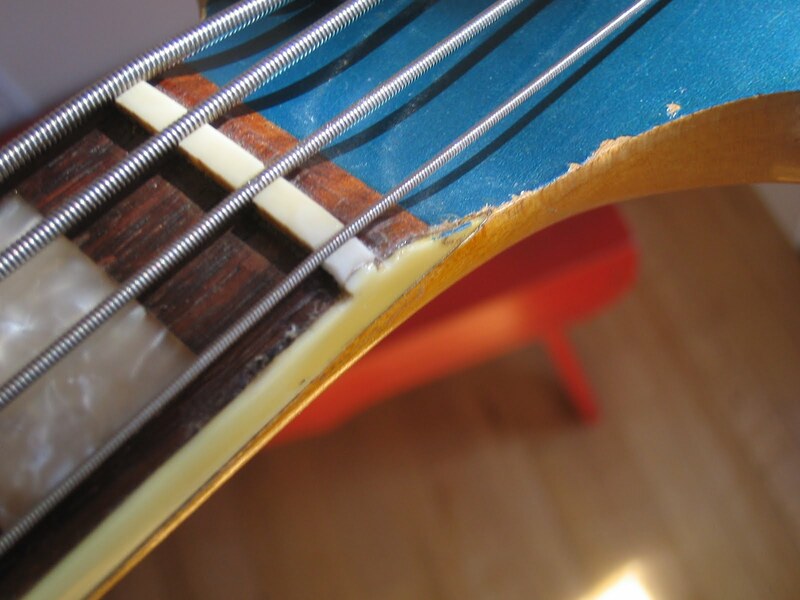 So now for the details on this bass. 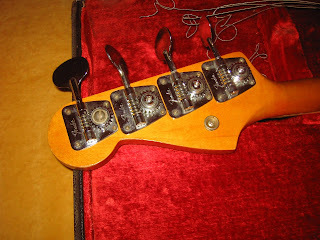 Everything else - down to the screws for the pickguard and the thumbrest - is factory original to this instrument. And it also comes in the original 1967 hardshell case, which is in very good condition. 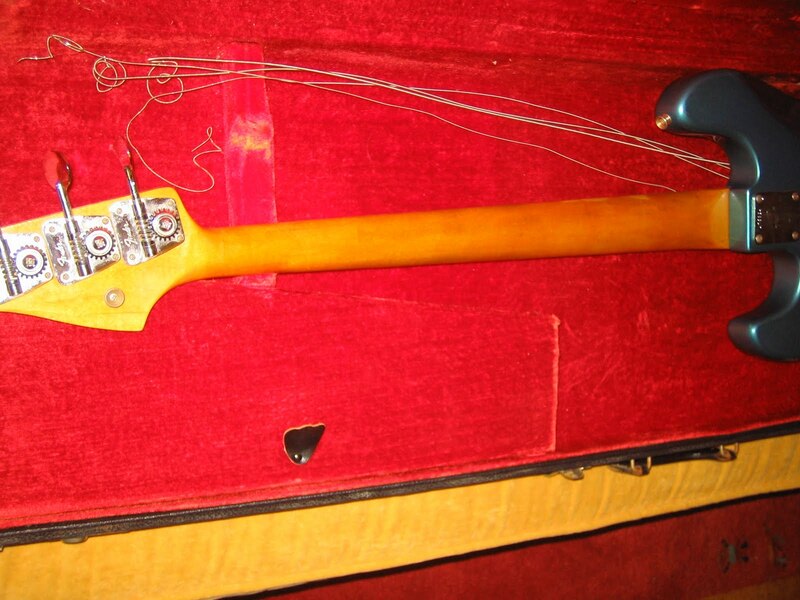 This bass was actually shipped during early 1967 - I refer to it as a "1966" because of the Dec 1966 neck date. However the pickups have handwritten dates of "1-8-67" and "12-30-66" on them. The neck and bridge pickups measure at around 6.8 K Ohms and 7.3 K ohms, respectively. As you can see, I also masked off the area under the pickguard and controls so it is less "aged" than the rest of the finish - as an original finish would be. 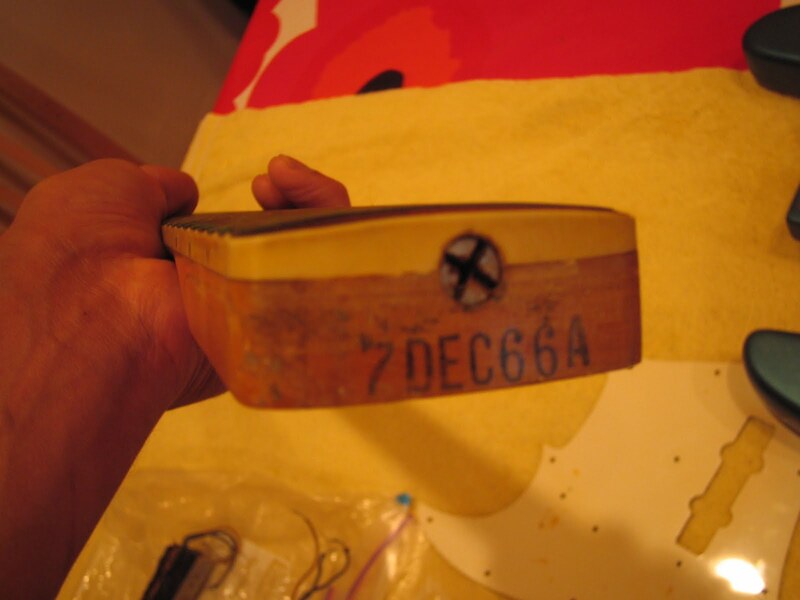 The control pots date to the 13th week of 1966, with the exception of the replaced tone pot, which dates to 1967. - the original late-1966 "F" neckplate and neck screws. 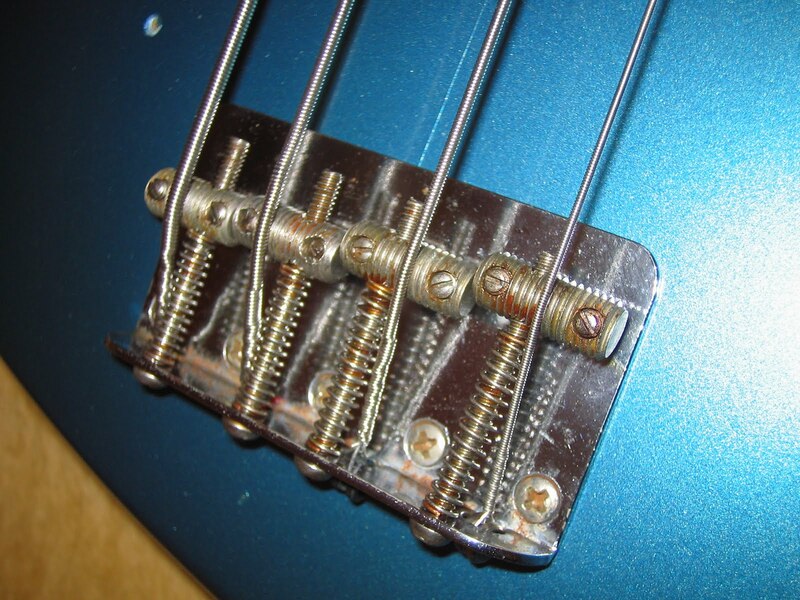 The bass plays very well - with low action and just a slight amount of neck relief and still a bit of travel left in the truss rod adjustment. There is NO lift of the first pearl block inlay, which can be a problem on some of the block inlay Jazz necks. 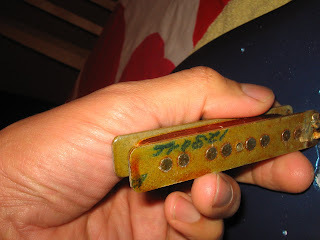 I have only done a very rudimentary setup on the neck, but that's because it felt great to me. The intonation is pretty much perfect all the way up and down the neck. The electronics sound great - with the neck pickup by itself providing some THUNDERING bottom-end, while the two pickups together sound more P-bass-ish. 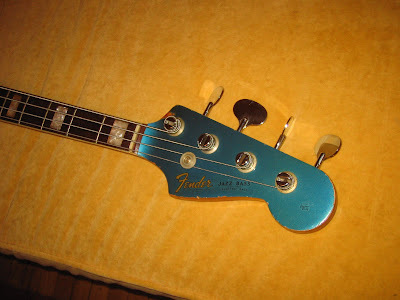 The bass weighs what a typical 60's Jazz Bass weighs, at a little over 9 lbs - making this comfortable to wear and play. I will ship internationally, but be aware that to some locations the case may be TOO large for usual shipping methods - leading to either exorbitant shipping prices or the need to ship the bass with the neck off and without the case. 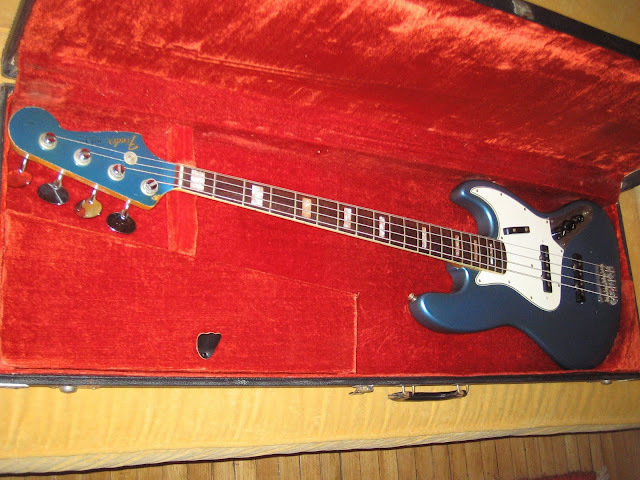 This is an opportunity to own an excellent and beautiful example of a mid-60s Jazz Bass, in its original case. Please contact me via my email (krishna at guitargarage.net) if you have any questions or would like more pictures - or if you want to BUY this bass !! Thanks to Rainer - enjoy the bass !!!! !